Q. When and how will AutoInvest start investing now that I’ve activated it? Once you have finished setting up the feature, it will immediately start scanning for investment opportunities matching your chosen criteria. If you have funds available in your Investment Account, as soon as a match is found, AutoInvest will invest in it. When you first setup the feature or subsequently edit it after setup, AutoInvest will scan all currently live pitches to determine if there are matches, which may trigger of number of investments soon after setup. After triggering these initial investments, AutoInvest will monitor continuously for new pitches that match your selected investment criteria. Q. Will I still be in control of my investments if I activate AutoInvest? Yes, you are always in control. With Seedrs AutoInvest, you have the option to cancel any investment made by AutoInvest until the campaign closes and for 7 days thereafter. You also have the flexibility to pause and restart at anytime from the main "Invest" page where you first set up the feature. You have the flexibility to add more funds or withdraw funds at any time from your Investment Account as usual. Q. Will AutoInvest invest in a company I’ve already invested in on Seedrs? No, AutoInvest will never invest in a campaign that you have already invested in manually on Seedrs. Q. Will I receive EIS or SEIS tax certificates for investments made by AutoInvest? Yes, if the company invested in qualifies for EIS or SEIS investment and you’re eligible for EIS or SEIS tax relief. Whilst your investment on Seedrs has been automated for you, everything else works just as if you’d invested manually - and that includes being eligible for tax relief. As usual, a digital copy of your EIS or SEIS tax certificate will be available to download from your Seedrs tax documents page once it is issued. To stimulate and support entrepreneurship, Her Majesty’s Revenue and Customs (HMRC) offers two tax relief schemes, EIS and SEIS. These are for UK taxpayers who invest in qualifying early-stage and growth-focused businesses that are permanently established within the UK. Please note that tax treatment depends on individual circumstances and is subject to change in the future. Investors who aren’t UK taxpayers are unable to take advantage of these schemes and the schemes are subject to change. Seedrs does not provide tax advice of any kind and nothing in these FAQs constitute such advice. Q. When will I be able to customise the feature with more options? The Product Team are always looking for ways to make improvements. We recently added customisable criteria and we are actively seeking feedback on which to add next. We will monitor this throughout 2019. Q. Can I set up auto top-up or a Direct Debit for Seedrs AutoInvest? Not yet, but we’re working on it. We’d like to make this option available in 2019. Q. How do I edit or pause Seedrs AutoInvest? You can pause Seedrs AutoInvest by expanding the AutoInvest panel in the campaigns page. When you next expand that section you will see an option to either ‘Edit’ or ‘Pause’ the feature. Q. Why didn’t Seedrs AutoInvest make investments for me? There are a few possible reasons why AutoInvest didn’t invest on your behalf, but the most likely is that your Seedrs investment account didn’t have enough available funds to purchase shares. AutoInvest will only invest if there are cleared funds in your account. There’s also a chance that you set the ‘maximum investment’ below the share price necessary to trigger investments. For example, if you set your maximum investment at £20 and the share price of a campaign was £30, AutoInvest will not invest, even if you have funds in your Seedrs Investment Account. Just increase your maximum investment amount to avoid this happening in the future. Q. Does Seedrs exercise any discretion through AutoInvest? Seedrs does not use any discretion when investing through AutoInvest. You make your investment decision when selecting your AutoInvest criteria. AutoInvest simply enables you to automatically invest in campaigns meeting your chosen criteria. Q. Are investments made through AutoInvest treated differently to investments made through individual campaigns, manually? No, any investment made through AutoInvest will be structurally the same as if you had invested into the campaigns individually. AutoInvest enables you to automatically invest in campaigns (either regular equity, fund or convertible) that meet certain criteria selected by you. 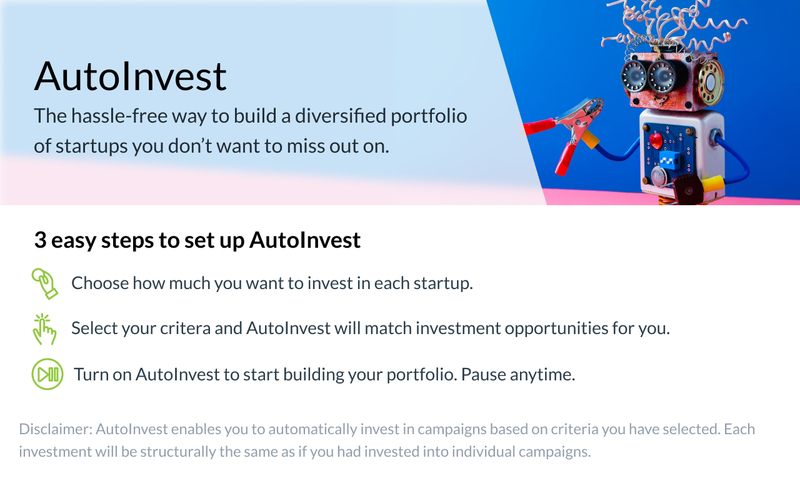 Once you opt in to autoinvest, investments will be made into campaigns that meet the criteria without you needing to select individual campaigns, but each investment will be structurally the same as if you had invested into the campaigns individually. You are able to activate and pause AutoInvest at any time, and you will have a period of seven days to cancel an investment made by AutoInvest.